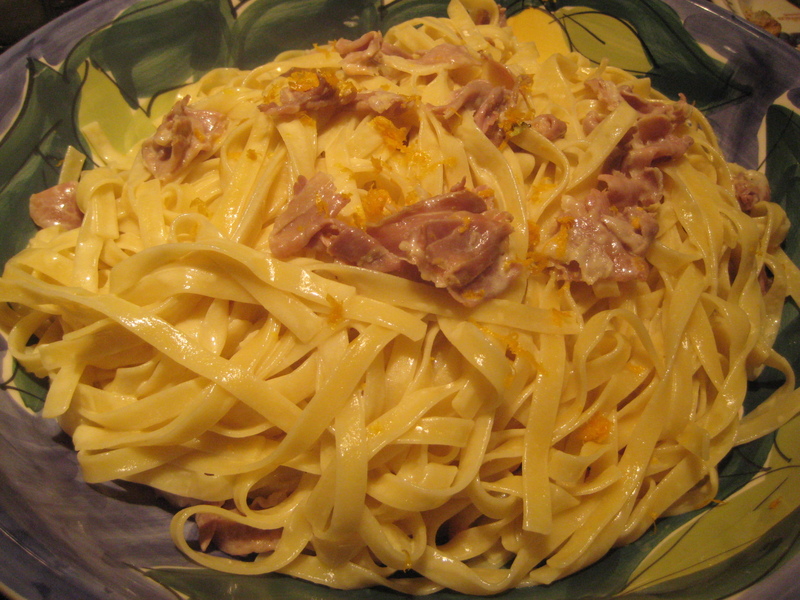 I’m a big fan of lemon-based sauces, but had never experimented with orange until I saw this recipe from the Italian issue of Bon Appetit: Tagliatelle with Prosciutto and Orange. I’m a sucker for any edition of any publication that features Italian food, but I’m usually disappointed in the recipes – they always seem to be the same. This was a rare example of a new take on pasta – something different than red sauce, white sauce, meat sauce, or clam sauce. Tasty as it is, it is not the prettiest dish. Though, I could have dressed it up a bit more with some parsley. 1) Make sure the prosciutto is cooked until crispy, you need that texture differential. This takes some patience and a pan that is large enough to give the pieces space to crisp, not steam. 2) This is one recipe where using the reserved pasta water is not optional. Many times you can improvise if you forget to put it aside – or just add extra cream – but the starchy water really seals the sauce in this dish.